Your not going to believe how much I got done this week on my Purple scrapes. I got two sets of the X'x and O'x done. Special for Valentines day. There is more purple from the other quilter over at Soscrappy and information about the Rainbow Scrap Challenge 2013. I just love following a long and doing the next colour. 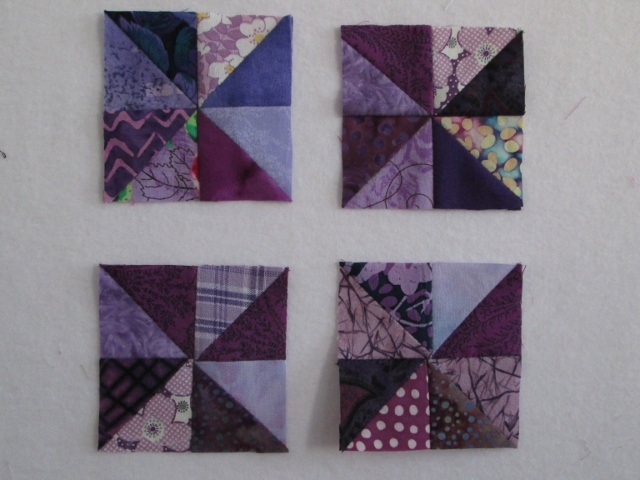 When I did the X's and O'x I have little bonus triangles and sewed them up in to units then into Pinwheels. Aren't they cute, less then 3". There were 8 pinwheels. 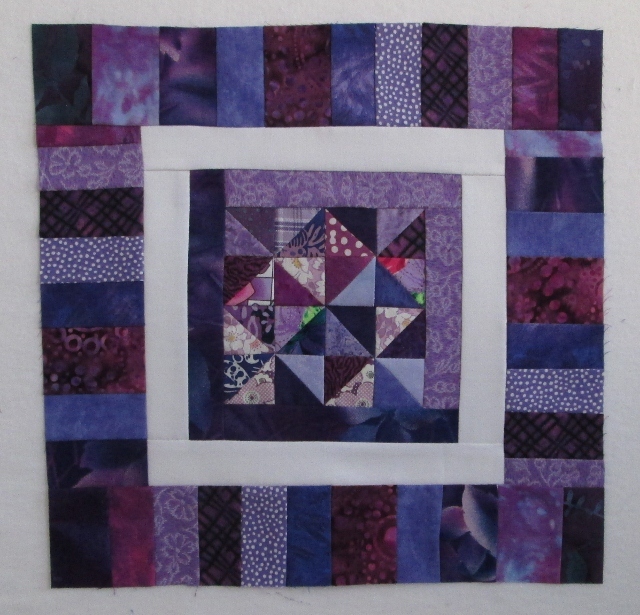 I used 4 in this block. It is finished to 12". I worked on this quilt all last year on the RSC 2012. 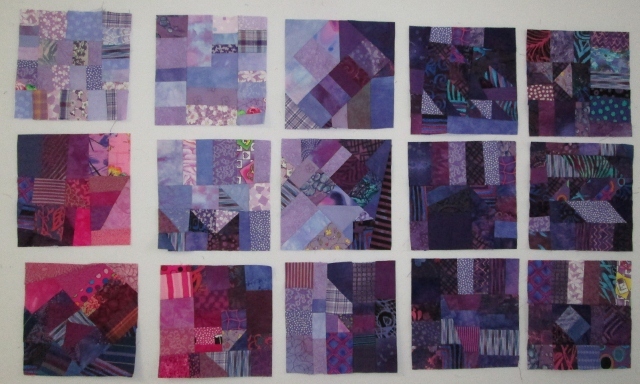 I had 24 blocks but needed one more block to make a 5 by 5 row quilt. Now to get the top put together. The hard part working on larger units. I will leave it for now. I am having to much fun making blocks. 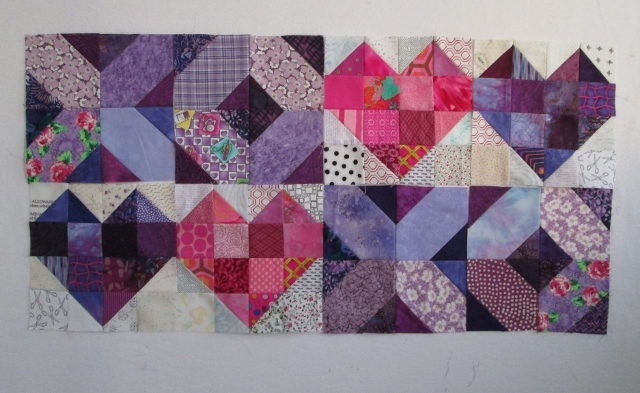 Then I did two more hearts in Purple this month. See what I may do. I have 4 pink hearts and two purple ones and then the X's and O's. I not really sure where this is going but so far it is looking good. 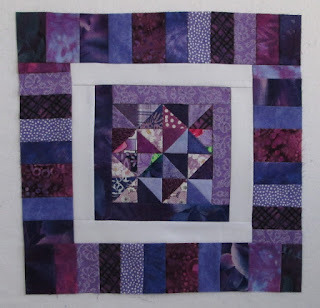 It could have just a few more blocks and be a cute baby quilt. Sometime this year we should have Red. Or maybe some other colours. Not sure it will be a true rainbow quilt as I may leave some colours out. 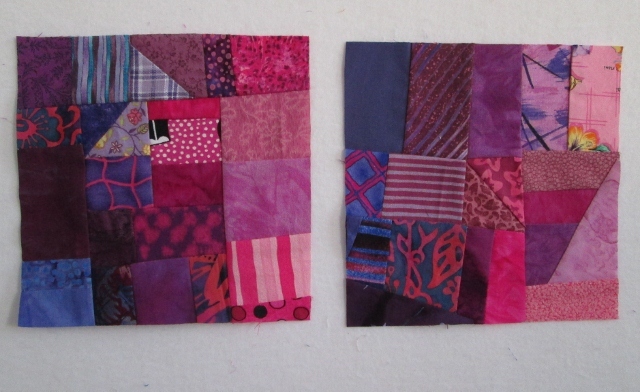 Ok the pink scraps are still not put away yet. I did a few 6" crumb blocks with purple and pink. 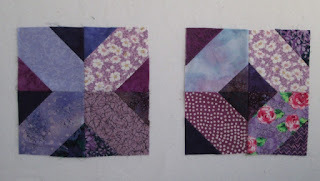 Way back in the fall of 2011 I found these batik crumb blocks of Kathy's and loved the colour flow she had going. I still like calling it poverty piecing more then Crumb blocks. I do not think she has finished the batik crumb quilt. Maybe she will see this and dig them out again. So with these 15 blocks you can see where I may go with the crumb blocks. I have 15 with purple (two were from last week but I did not like the number without showing them all). I just do not stop or show 13 blocks. Bad number. I have five in pink from last month. 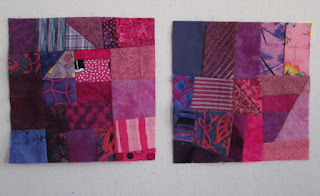 I found more pink and purple strips so I added a little more to my "Around About" again this week. I like it as it gets a little more wonky and not so square. Now I think it is done till next month. What colour next? OK I really do not like this block. I was aiming for a pansy flower. Not good. Does anyone have a good pansy block? I thought I had a book with a good pansy block but can not find my book. It is in the messy sewing room. See I told you you would not believe what I got done this week. Wow! 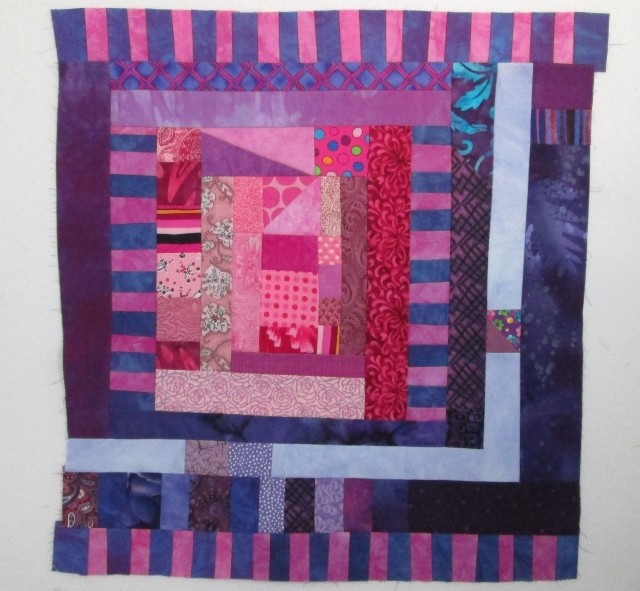 You have so many options to use your purple and pink blocks! 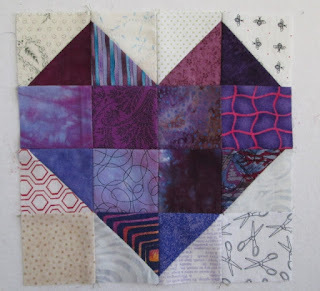 Love all your blocks and very impressed that you were able to use the extra triangles to make yet another project. Well done! Wow, did you make all those blocks is just a week? That's very impressive! I love the idea of the heart blocks with the X's & O's. Total fun, Cathy; total fun! So many great blocks this week! Love all the collections you have going on. Cathy, loving your hearts and X's & O's. You have had a productive week, good for you. I'll keep my open for a pansy block, I love pansies. What a delightful post. So many pretty rainbow blocks! I'm going to enjoy watching your rainbow block collection grow. My goodness, what purple wonderful-ness! 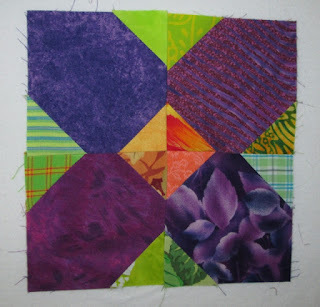 Love the way the two colors play together :*) And good for you salvaging those tiny scraps and making the cute pinwheels! I can't wait for the next color!!! You have been busy. I was thinking I had an X and O dream idea for a quilt.... now I am wondering if you mentioned it and I forgot! I have yet to make any of them but love how your blocks area all coming out. Gorgeous blocks! XO's and hearts are adorable!